On May 17--the International Day Against Homophobia, Transphobia and Biphobia—CAAWS and the Canadian Centre for Ethics in Sport (CCES) called on all Canadian sport leaders to take action to make their sports welcoming and inclusive of LGBTQ-identified individuals. CAAWS and CCES share a common goal of strengthening the Canadian sport system to be welcoming and inclusive for all Canadians. The organizations are committed to providing leadership and support for sports in this regard. CAAWS is grateful for the dedication of its remarkable Women and Leadership workshop facilitators. Thanks to these leaders, 50 workshops for 650 women were delivered all across Canada in 2016-2017! Experienced leaders themselves, these facilitators are creating opportunities for other women to develop the skills and confidence to step into leadership roles throughout the sport and physical activity system. The Women and Leadership Program consists of a series of six professional development sessions for women working and volunteering in sport and physical activity, including a brand new workshop for university and college aged women. Learn more about our upcoming workshops and book yours today! Newly revised in 2017 with the support of Sport Canada and in partnership with AthletesCAN and the Coaching Association of Canada, CAAWS’ ground-breaking resource - Leading the Way: Working with LGBTQ Athletes and Coaches—is a practical resource for coaches to create welcoming, inclusive teams. This second edition now includes the Canadian results of the international Out on the Fields Study on Homophobia in Sport (2015), and reflects the recent guidance to sport organizations on creating inclusive environments for trans identities released by the CCES. Click here to download the new edition! Make sure to participate in our upcoming webinar, led by Jennifer Birch-Jones. Contact CAAWS about delivering this session for your own organization or community. Build leaders on and off the field of play this year with the CAAWS Leading with Confidence workshop! CAAWS’ newest Women and Leadership Program workshop is designed to uplift the skills of the next generation of Canadian sport leaders – university and college aged young women involved in sport and physical activity including varsity athletes. CAAWS is pleased to welcome Mikaela Martin as the Manager of Projects and Communications! 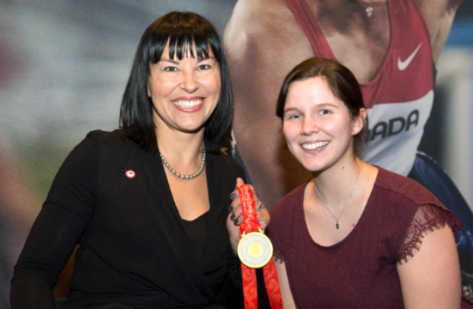 Mikaela has gained valuable experience working with many organizations including Commonwealth Games Canada, Gymnastics Canada, TO2015 and the Canadian Paralympic Committee. We are excited to have her on the CAAWS team and look forward to her many contributions to come. Cindy Klassen, the most decorated Canadian Winter Olympian in history in Speed Skating, Carol Huynh, two-time Olympic medallist in wrestling and the Edmonton Grad Basketball Team, the best basketball team the world has ever seen on their induction into the Canada Sport Hall of Fame. Tricia Smith on being re-elected as President of the Canadian Olympic Committee. Olympic medallist Therese Brisson on her re-election to the COC Board of Directors as well as business leader Maureen Kempston-Darkes and corporate director Karen Rubin on being elected for a first term. CSI Pacific CEO Wendy Pattenden, SIRC CEO and President Debra Gassewitz and Level 4 NCCP synchronized swimming coach Sherry Robertson on their election as B members of the Canadian Olympic Committee. Linda Cuthbert, nominated by The Honourable Carla Qualtrough, Minister of Sport and Persons with Disabilities to the Sport Dispute Resolution Centre of Canada (SDRCC) Board of Directors.